The fifth wild camp, the introduction to the tarp or more specifically the amazing MLD Trailstar! Having briefly explored the world of hammock camping which changed my view on Wild Camping. I was looking for something that offered the same open feel of a hammock but wasn’t constrained to woodland and provides a warmer environment during the winter months. Enter the TrailStar! Reading through a walking magazine, specifically The Outdoor Magazine, I came across an article by Chris Townsend. For those of you that aren’t aware of who he is, which I wasn’t at that time, he’s an extremely experienced author/walker/adventurer/wild camper. The article he’d written talked about his favour of the TrailStar, a pentagonal silnylon tarp made by the american company Mountain Laurel Designs. The tarp is an ultra lightweight shelter that requires a couple of walking poles (or one and a stick). Its suspended over a centre pole to create a large living space that is large enough for 2 or 3 people (at a squeeze). The shelter is adjustable in that the height can be set dependant on the whether. If its blowing a gale (50mph+) then it can be set low and creates an aerodynamic shape that shrugs off the wind without any difficulty. If on the other hand the whether is nice the pitch can be setup high, providing 360degree visibility achieving that open feel. The route started off at the Fox House Inn on the A625 near Hathersage. Leaving the carpark we followed the path over Burbage Rocks and Stanage Edge, reaching High Neb and dropping down to Bamford Moor. The weather until this point was fair, as soon as we reached the centre of Bamford Moor things changed. Unfortunately I didn’t capture the full extent of the storm as I was more concerned about lightening/frozen hands, so failed to start the GoPro recording. Once in the shelter of the woods on the East slopes of Ladybower things were more pleasant. 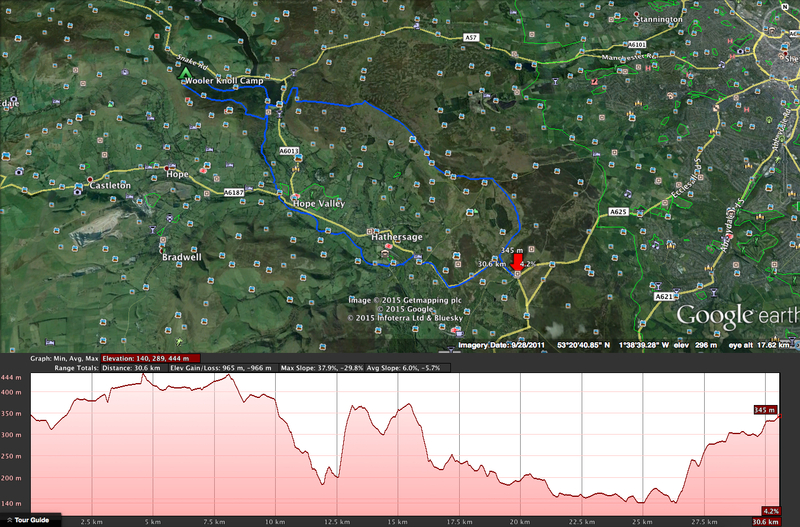 The route crossed the dam of Ladybower and started to climb towards Win Hill. Due to the lack of remaining daylight we didn’t head to the summit and instead circled Win Hill at the tree line north to Wooler Knoll. The spot was selected based on a great video a fellow Wild Camper had recently posted about his stay their (Dean Read’s website, check it out). Like most of the Peak District woodland in this area the ground is uneven, damp and littered with fallen pine trees. After a short search about we settled in a perfect spot for the night. The usual wayfarer meals followed by coffee and wiskey. The night was very very windy, I think that evening a amber/red whether warning was issued to the area unbeknown to us! The following morning after packing away and making sure all sign of our stay was cleared away we started the walk back to the Fox House Inn. The route back followed the Derwent Valley Heritage Way which walked alongside the Derwent river below Hathersage. Leaving the path a short climb back to the A625 takes you back to the Fox House Inn. A great route with plenty of variety in terms of scenery, moorland, woodland, rivers and reservoirs. Highly recommended! See the Wild Camp Map page for more route info. 1. Put you gloves on before you hands get cold!